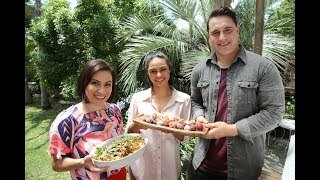 MKR foodies Jay and Sarah join Stacey in the kāuta to make two delicious, tamariki-friendly recipes: Kūmara And Mixed Bean Salad With Balsamic Vinaigrette and Simple Bliss Balls! Rawe! For more on Jay and Sarah and their wonderful mahi, check out jayandsarah.nz or follow her at Facebook and Instagram.